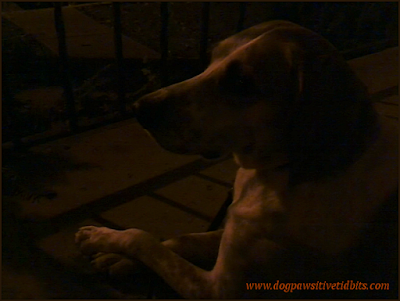 Yes, my coonhound is a porch dog! By day or by night there is no more blessed sight than that of my dog Valentino sitting by my side on the front porch of our home watching our world go by. A year ago I brought Valentino home as a foster dog. 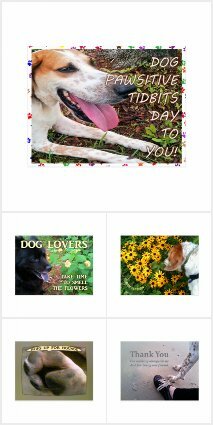 (Of course that led to our adoption of one another!) I captured a photo of Valentino taking the steps up to our deck that first time. The fear in his eyes was apparent as he hesitated that day, though it would not take long for my new best friend to easily adapt to new surroundings—as long as I was nearby. He has learned to trust that I will not ask him to go anywhere that might hold a frightful experience for him. 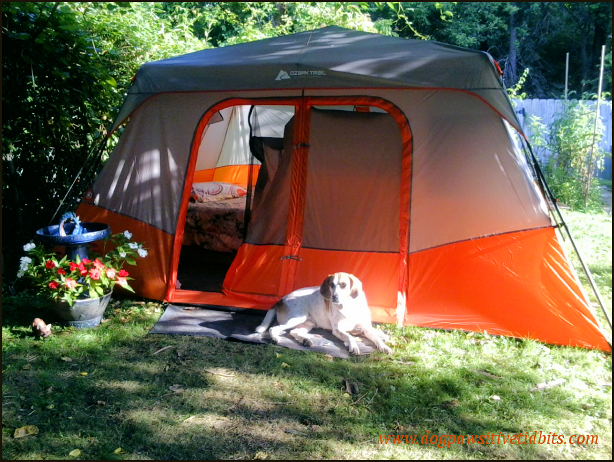 In our travels, Valentino became a tent dog for a couple of months when we moved from Florida to Ohio. He settled in nicely to camping out and enjoyed soaking up a bit o' sunshine on the mat at the door of our tent. Living in a tent made for some of the best days of our lives together and will forever remain as some of my favorite memories of sharing good times with great friends. Nowadays my dog and I have moved on up to apartment living in a rural town in central Ohio. 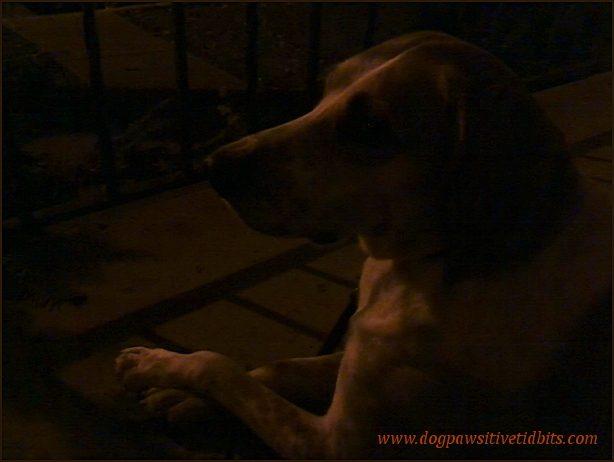 We live right in the downtown atmosphere and together we enjoy sitting on our front porch. No matter the weather we spend a bit of our time each day watching the life of the city go by. We have yet to sit on the porch in the snow. As we face our first northern winter together, I am thinking Valentino would appreciate a heated dog mat for that rather than the cold of a snow-covered concrete porch! Valentino is mesmerized by our reflection in the front room window as we sit on the porch steps on a rainy day. 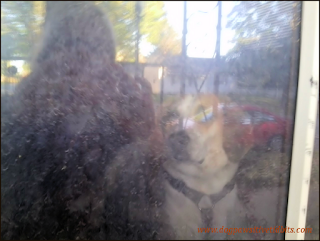 Interestingly, this dog has always shown an intense interest when seeing his mirrored image. I guess he is as impressed with himself as I am of him! 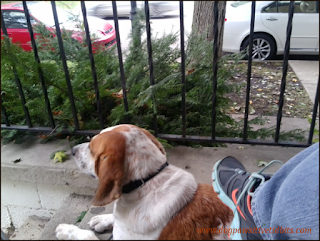 Yes, we have come a long way from foster dog to our adopt-a-dog day and now we look forward to many more days of front porch sitting together. Do you have a dog with whom you share time sitting on the porch? 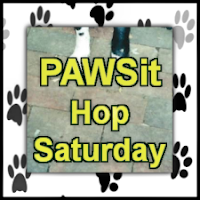 We invite you to share your porch dogs and pictures by writing about them and linking your dog sitting tale up with PAWSit Hop Saturday! This list runs from today through next Saturday, so feel free to share your link anytime throughout the week. Grab the code for your PAWSit article.